Retiree Tom Pettigrew has published more in the last 10 years than any decade of his life. Photo by J. McNulty. For some, retirement means slowing down and shifting gears. Not so for Thomas F. Pettigrew, a research professor of psychology at UC Santa Cruz who just received a UC-wide award for accomplishments since retirement. "I've published more in the last 10 years than any decade of my life," said Pettigrew, a joyful 70-something who, by way of explanation, noted with glee, "No interruptions!" Pettigrew, an internationally renowned expert on racism and intergroup relations, has received the University of California's 2008/09 Constantine Panunzio Distinguished Emeriti Award. The honor marks the third time a UCSC retiree was selected, and the second time in three years. 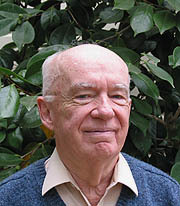 G. William Domhoff, a research professor of psychology and sociology, received the 2006/07 award, and Hayden White of history of consciousness was a recipient in 2000/01. Pettigrew shares this year's award with Daniel Walker Howe, professor emeritus of history at UCLA. "As Tom Pettigrew's outstanding work demonstrates, the extraordinary engagement of our emeriti faculty reflects the passion they bring to their work--a passion that for many does not wane when they leave the classroom," said Chancellor George Blumenthal. For more than five decades, Pettigrew has been a leader in the field of social psychology. His research focuses on unlocking the mechanisms of racism, and his scholarly contributions since his official retirement in 1994 continue to shape the field. "I'd rather be doing this than almost anything else," said Pettigrew, who continues to travel extensively with his wife, Ann. "I just accepted an invitation to attend a conference in Spain in October. My wife loves Spain." The author of more than 300 scholarly articles and book chapters, as well as nearly 100 book reviews, Pettigrew recently published a highly influential meta-analysis of the scholarly research on the value of contact for reducing prejudice. Evaluating more than 500 studies of intergroup contact from around the world--between blacks and whites, as well as between straights and gays, deaf and hearing individuals, and blind and sighted people--led Pettigrew and coauthor Linda Tropp of the University of Massachusetts, Amherst, to the powerful conclusion that interacting with members of other groups does reduce prejudice. "In only 6 percent of the 515 studies did we see an increase in prejudice," said Pettigrew. "The principle is really there." The meta-analysis, published just three years ago and already considered a classic in social psychology, triggered a surge in research by investigators eager to shed more light on the dynamics. "That study gave people the confidence that there's really a phenomenon here," said Pettigrew. "Now the question is why. Why does contact reduce prejudice? I've been working on that, and so have a couple hundred other people." So far, Pettigrew and Tropp have discovered that intergroup contact reduces anxiety and increases empathy, which contribute nearly equally to declines in prejudice. Pettigrew grew up in the South and taught at Harvard University for many years before relocating to Santa Cruz in 1979 and formally joining the UCSC faculty in 1980. He has spent much of the last two decades focusing his research on intergroup relations in Western Europe, where immigrants from Africa, Asia, Eastern Europe, and the Middle East have been the target of growing racism and ethnic prejudice. In 2006, he traveled to South Africa to mark the 50th anniversary of his first visit there with his mentor, pioneering social psychologist Gordon Allport. Highly honored for his scholarly contributions, Pettigrew has twice received the prestigious Gordon Allport Intergroup Relations Prize from the Society for the Psychological Study of Social Issues. He has also received lifetime achievement awards from the American Sociological Association, the Society for Psychological Study of Social Issues, the Society for Experimental Social Psychology, and the International Academy for Intercultural Research. Last year, he received the UCSC Social Science Division's Distinguished Emeriti Award, and earlier this month he delivered the campus's Emeriti Faculty Lecture, an annual event sponsored by the Office of the Chancellor. The Constantine Panunzio Award, which carries a $5,000 prize, was created in 1983 by a bequest from Panunzio, a UCLA sociology professor who has been described as the architect of the UC Retirement System, as well as an early writer on the World War II internment of Japanese Americans. The award honors outstanding scholarly work and/or educational service since retirement by UC faculty emeriti in the humanities or social sciences. Nominations are submitted to each campus's emeriti association, reviewed by campus provosts, and presented to a board of directors that selects the recipient(s). Pettigrew's fellow recipient, Daniel Walker Howe, is the author of What Hath God Wrought: The Transformation of America 1815-1848, a masterpiece of historical narrative that won the 2008 Pulitzer Prize for History and the American History Prize of the New York Historical Society. Since retiring, he has presented seminars on history to hundreds of K-12 teachers in the Los Angeles area, increasing their knowledge of U.S. history and enhancing their instructional skills.